One of the great joys of books is the ability to revisit an old favorite. 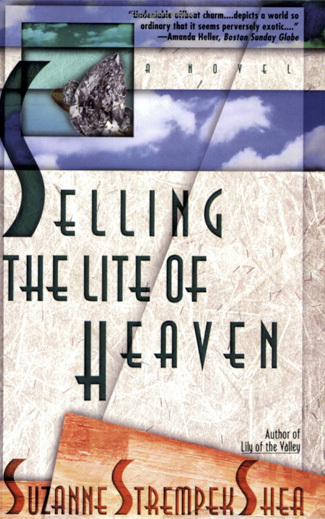 I took that opportunity recently and reread "Selling the Lite of Heaven," the debut novel by Suzanne Strempek Shea. The unnamed narrator is a thirty-something Polish Catholic from Palmer, MA, who "has been left for God." Her fiance, Eddie Balicki, who she first met in Church, decided to leave her and become a priest. Her task now is to sell her engagement ring. Described as having "The Lite of Heaven," her ad in the local Pennysaver will run until the ring is sold. The novel interweaves the story of her romance with Eddie with the tale of her attempts to sell the ring. I first read this novel over 15 years ago when it was new. Even then, it was somewhat frozen in time. Now, it reads like historical fiction, painting a portrait of life before the internet and cell phones. The narrator works at a photo processing place where photos are guaranteed within 24 hours and everything is on film. In so many ways, it was a different world, and rereading it brought me back to that place of my youth. This novel is incredibly Catholic. It was perhaps my first introduction to Catholic fiction, all the more remarkable because it was published by a mainstream publisher. Those who have grown up Catholic in an immigrant community will definitely see themselves in these pages. "Selling the Lite of Heaven" is a delightful read with an engaging premise. If it were written today, it would be a vastly different story, but as it is, it is full of charm, a vignette of a by-gone era, and a wonderful escape. Friend and servant of our Saviour, I too am “troubled about many things”. (mention your intentions) Pray for me that I may grow in faith, hope and love, and that Jesus, who sat at your table, will hear me and grant me a place at the banquet of eternal life. Amen. My local Diocesan magazine, "The Catholic Mirror" features a column each issue from Paul Jarzembowski, who blogs at Spiritual Popcorn. After reading his columns for some time, I was inspired to check out his blog. Paul is obviously someone who loves movies (as much as I love books!) and works to find the spiritual themes in them. His profile states: Paul Jarzembowski is the Director of Young Adult Ministry for the Catholic Diocese of Joliet in Illinois. He is also the Acting Executive Director of the National Catholic Young Adult Ministry Association (NCYAMA). He is currently a grad student in the Institute of Pastoral Studies at Loyola University Chicago, and in the meantime writes as a "movie theologian", exploring the connections between pop culture and faith. I encourage you to check out his blog. Iraqi Sister Olga Yaqob is beginning a women’s religious order in the Boston Archdiocese this year to carry out the Church’s mission to evangelize. “Our main spirituality will focus on Jesus, and then carry his presence out into the world,” Sister Olga told CNA on June 21. The 44 year-old sister — known for her tireless energy and beloved by her students — responded to an invitation from Cardinal Sean O’Malley to start the new order and is leaving her current post as chaplain at Boston University. Sister Olga explained in a June 21 interview that the process of founding the Daughters of Mary, Our Lady of Nazareth has been three years in the making. She said that Cardinal O’Malley was familiar with her personal story, including her conversion to the Roman Catholic Church six years ago after being a member of the Assyrian Church in Iraq and starting a women’s order there in 1995. “He knew a lot about the history of my vocation and ministry in Iraq and also here in the United States before he received me into his diocese,” she said. After observing her work with young people at Boston University, as well as her service to parishes throughout the archdiocese, the cardinal asked Sister Olga in 2008 if she would consider founding a new women’s religious community. Tomorrow (July 26th) is the feast of St. Anne and St. Joachim, the parents of Mary. St. Anne has always been one of my favorite saints and I took her name as my confirmation name. Although most of what we know of her is legend (from the Protoevangelium of St. James which dates from the 2nd century), we can rest assured that Mary indeed did have a mother and Jesus a grandmother and that she must have been a very faith-filled special woman. 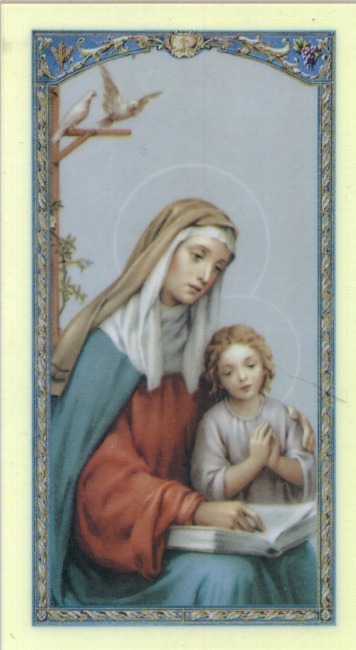 I ask St. Anne for help daily in parenting my children. We call upon you, dear St. Ann, for help in bringing up our family in good and godly ways. Teach us to trust God our Father as we rear the precious heritage entrusted to us. May His will prevail in our lives and His providence defend us. These blessings we ask for all families in our neighborhood, our country, and our world. Amen. Huntington, IN: Our Sunday Visitor, 2006. Due to "The Da Vinci Code," Mary Magdalene has received a great deal of attention lately. Unfortunately, much of what people have been saying about her is based in myth and legend. Amy Welborn, who has a Masters degree in Church History, sets out to lay the record straight in "de-coding Mary Magdalene: Truth, Legend, & Lies"
Welborn begins with what the four canonical Gospels have to tell us about Mary Magdalene. "The four Gospels in the New Testament have been accepted as the most authoritative and accurate writings on Jesus' life since the early second century." Welborn is quick to point out that those who refute the Gospels' accuracy on the basis of time or distance from the events they depict, are often eager to hold up another work as truth (most often one of the Gnostic gospels) which were actually written later. 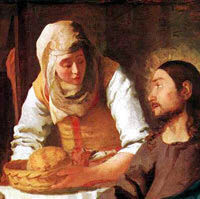 One of the unique features of Mary Magdalene is that she is identified "not by her relationship to a man, as most women would be at that time, but to a town . . . she was a single woman, able to give support to Jesus out of gratitude for what he had done for her." Welborn also emphasizes the important point that Mary Magdalene was never associated with sinfulness in the Gospels. She was a woman possessed, and at this time, possession had nothing to do with sin. She was however at the margins of society, until Jesus came along and saved her. She would then go on to be one of his most faithful followers, being among the first to bear witness to the Resurrection. Welborn does spend some time discussing the Gnostic writings and what they have to say about Mary. She makes the interesting point that in these writings, the Mary being spoken of is not identified as Mary Magdalene. It is possible they are speaking of Mary, the Mother of Jesus, or even an amalgamation of several of the Marys who are so prevalent in scripture. The Gnostic texts are the source of the popular idea that there was a battle for power in the early Church between Peter and Mary Magdalene. Welborn maintains that there is no evidence that these Gnostic texts represent actual events that happened in the first century. They were separated from those events by at least a century, and present a radically different view of events than the canonical Gospels and other New Testament writings which were composed much earlier. They tell us a great deal about the Gnostic view of life but almost nothing about the persons of Jesus, Mary Magdalene, or the other Apostles. Welborn then turns her attention to how the Catholic Church has imaged Mary of Magdalene through the centuries. The early Church Fathers regarded her as "Apostle to the Apostles," a moniker which has been retained in the Eastern Church. In the West, things got a little murky when Pope Gregory I confused Mary Magdalene with the unnamed penitent women in Luke 7. He was not seeking to demean her, however, but rather to hold her up as an example of repentance. The idea of the Church waging a mass media campaign to sully her reputation just doesn't hold water. Welborn then delves into how legends surrounding Mary sprung up during the middle ages, and the ways that she has been portrayed in art throughout the centuries. "de-coding Mary Magdalene" is very interesting reading. Welborn does a great job of examining historical sources and presenting them in an easy-to-understand format. This is a brief, yet remarkably thorough work. Welborn provides two useful appendices. The first includes all the scriptural references to Mary Magdalene. The second contains "The Gospel of Mary." She also provides a list of resources for further study. This book is a must-read for anyone who wants to know the truth about Mary Magdalene. Ahh, Catholic Guilt. I've certainly spent my time wading in that pool. Yet, here is the thing that most people miss. When you do something wrong, you are SUPPOSED to feel bad. It means you have a conscience, that there is such a thing as right and wrong, and serves as a kick in the pants to change your life and make amends. Spoiler alert: Please do not read this article if you have not read the books and plan to see the last movie. I came to the Harry Potter books late. I didn’t read them until my children wanted to read them. As a result, unlike those who had to wait patiently or not so patiently for the next installment in the series, I was able to read all seven books in quick succession. It is only in light of book seven that the whole series makes sense. Harry’s ultimate purpose and author J.K. Rowling’s message come to light. I have seen all the movies as well. The last three were family events we eagerly looked forward to seeing in the theater. Overall, I found the movies a little disappointing, but there was no way they could not be. The books were so huge and masterfully written with so many different subplots and motivations. There was no way to convey all of that on the big screen. Yet, they were entertaining and my children greatly enjoyed them, even though even they would cite all the inconsistencies between the two mediums. The last movie, in the theaters now, is arguably the best as far as it goes. It is fast paced, entertaining, and features some great one-liners to lighten the mood amidst all the pain. It follows the story line of the book rather closely and wraps up all the loose ends. I’m sure that those who have only seen the movies are fully satisfied. Yet, as a Catholic reader of the books, I left the theater feeling as if the movie had missed the whole point. Yes, Harry goes to the forest to die at Voldemort’s hands. He does not resist. He has learned what he must do and he sets out to do it. But, the reason he does it is lost. In the movie, his motivation seems to be that he was told he must. In the book, the whole reason he goes to the forest is because by his death, he will save everyone else. No one else will have to die. It is the ultimate self-sacrifice. “Greater love than this no one has, that one lay down his life for his friends.” John 15:13. Of course, Harry doesn’t actually die. What he does have is a near-death experience in which he is reunited with his esteemed headmaster, Albus Dumbledore. The movie uses many of the same lines as the book, but it misses a key part of the conversation. In both venues, Harry is given the choice whether to return to the world or go on. In the book, however, Dumbledore tells him, “By returning, you may ensure that fewer souls are maimed, fewer families are torn apart.” Once again, the motivation is self-sacrifice. The final battle between Harry and Voldemort is also lacking in substance. The reason Voldemort’s spells no longer work on anyone is because of Harry. In the book, Harry tells him, “I was ready to die to stop you from hurting these people . . . I’ve done what my mother did. They’re protected from you. Haven’t you noticed how none of the spells you put on them are binding? You can’t torture them. You can’t touch them.” Just as his mother’s love saved Harry all those years before, now his love has saved his friends. Despite the offer, Voldemort continues with his plan. It is important to note that Harry doesn’t kill him – he only disarms him. Voldemort’s own spell backfires and ends his life. Voldemort chose evil and his future in hell. Even at the end, he could have made a different choice. The Christian themes of self-sacrifice and redemption pulse through the book, yet were unfortunately ignored in the movie. If you are a Harry Potter fan, you will definitely want to see the movie. You will enjoy it. But do yourself a favor and read the books as well in order to fully understand the true motivation behind the acts. I read this quote today in Difficulties in Mental Prayer: A New Edition of a Classic Guide to Meditaion by M. Eugene Boylan, O.C.R. I know I often have regrets about my past - the mistakes I made along the way, the sins I committed. This is a good reminder that God is the one ultimately in charge and He can, and does, bring good out of the messiness. "To them that love God, all things work together unto good," writes St. Paul, and that includes even our sins. God has infinite power and infinite mercy. He can utilize all our past and turn it to good account. In it was this very good line: "The opposite of love isn't hate, it is selfishness." Love always calls us to put the other first. We can't love if we are only thinking about our own needs and wants and what we can get out of the relationship. We need to want what God wants for that person. We need to give all we can give. Of course, we are going to fail sometimes. None of us is perfect, but it certainly gives us something to aim for. In the past two days, I've read two articles on the importance of exercise for the spiritual life. Maybe God is trying to tell me something! I still don't think I'll be running any marathons anytime soon! But, the articles are good and make some very valid points. Regular exercise is good for all of us (I do try to walk whenever I can) and it is good for our spirit as well as our bodies. One of my pipe dreams in life was to start a college. I dreamed of a school of Catholic Higher Education in which the classics were studied and rather than subjects being taught individually with little connection between disciplines, there would be cohesion. Each semester would focus on a different historical period in which the literature, art, music, scientific discoveries, and history of that time period could be studied. Now, of course, these colleges do exist. Nearby New Hampshire seems to be especially fertile ground for them, with Thomas More College of Liberal Arts, The College of St. Mary Magdalen and now The Erasmus Institute of Liberal Arts (actually founded by Peter Sampo, one of the founders of Thomas More College of Liberal Arts). It is wonderful that there are so many wonderful choices for those seeking this type of education in this part of the country. While my dreams of starting a college like this have come and gone, I still hold on to the dream of working at or teaching at one! This passage from St. Paul to the Romans is a reminder to all of us that we are works in progress. I recall being young and looking at people who were ten years older than me and thinking that they had it all together. Now, I know better. There is no magic age at which a person figures everything out. Every age, every stage of life has its own challenges. One may gain wisdom with age, a better sense of perspective, and a greater reliance on and trust in God, but life doesn’t actually get any easier. It isn’t supposed to. In my own life, I have found that the trials are somewhat cyclical. There will be a time of great testing. I will feel as if there is no way for me to make it through. I spend time desperately praying, searching for answers that seem nowhere to be found. My emotions run the gamut from anger at God to begging for the cross to pass to acceptance of what is and praying for the strength to do what needs to be done. In time, I once again reach a period of equilibrium where I feel on solid ground. While I am thankful for those periods of respite, I also fear them because I know another trial is just around the corner and I do not know what it will entail. I have also found that the trials are particularly designed to expose and strengthen my personal areas of weakness. I imagine that they wouldn’t be considered trials if they weren’t. If I pass the test at one level, I am given a harder test the next time around. If I fail, I find I am frequently given a second (and third and fortieth) chance to learn the much-needed lesson. God keeps working at me, trying to form me into what I should be. I believe that He does this with all of us. One of the most beautiful images in scripture is that of us being clay in the potter’s hands. (Isaiah 64:8) In order for a lump of clay to be turned into something beautiful and useful, it must be worked and kneaded and shaped and fired. God is working on us, creating something amazing, but the process can cause great pain. We need to trust that the outcome will be wonderful beyond our wildest imaginings. My Grandniece was born this morning - the first child of the next generation of my family. All went well with the birth and the little girl is beautiful. Thank you for your prayers. Book Review: "The Monastery of the Heart"
"The Monastery of the Heart" by Sr. Joan Chittister is intended as a how-to manual for those who want to live by the Benedictine Rule while out in the world. "For Benedict of Nursia, the spiritual life lay in simply living this life, our daily life, well. All of it. Every simple, single action of it." Sr. Joan invites those of us out in the world who seek to live a more spiritual existence to incorporate Benedictine spirituality in our daily lives. To do so, one must begin with the Word of God itself. "As monastics of the heart we must read the scriptures day in and day out, till they ring in our ears, and fill our hearts, and become the very breath we breathe." The Rule then asks for participants to be constant at prayer and to perform the work of God. It invites us to measure our words and embrace the gifts of silence. It calls us to love simplicity rather than the amassing of material goods, to value our work and offer it to God, to welcome the stranger, and to live humbly. "Monastery of the Heart" is an unusual text in that it is written in prose verse which gives it a lyrical quality. The passages are full of wisdom and will inspire thought and conversion of heart. 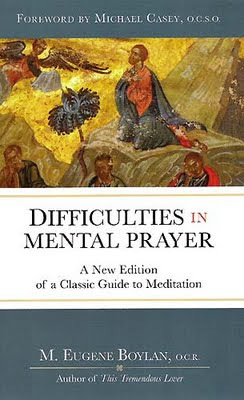 The highlight of the book is the chapter on humility. "In Benedictine spirituality, there is a twelve-runged ladder that leads to God. This ladder that reaches between us and God is called 'the steps of humility.'" If one follows these twelve steps, one cannot help but grow closer to God. Sr. Joan has certainly been a controversial figure in her life. She has said much I do not agree with. However, her most recent books have been exemplary and entirely in keeping with Church teaching. 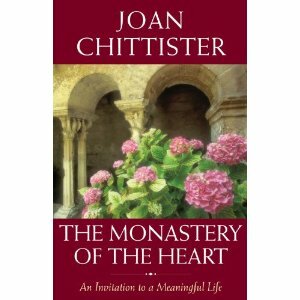 "Monastery of the Heart" offers a practical guide for those searching for "something more" in their spiritual lives. It is a blueprint for living as a monastic out in the world. more - or less - holy. And, so it is. Every moment of our lives, if offered to God and done to serve Him, is holy. That includes the time spent with the laundry or scrubbing the floor. First of all, we do these things because they are part of our vocation and one of our primary duties on this earth is to serve God by living our vocation to the best of our abilities. Secondly, we do our housework to serve those we love – so that they may have clean dishes and clean clothes and a healthy environment to live in. It may not seem that way as we are struggling to get it done, but doing the housework is actually an act of love. I'm late posting this, but today (July 1st) is the feast of the Sacred Heart of Jesus. This picture was always in my home growing up and I have one hanging in my house today. I always find it comforting to look at. O Lord, Jesus Christ, to Your Most Sacred Heart I confide this intention . . .
Sacred Heart of Jesus, I have asked for many favors, but I earnestly implore this one. Take it, place it in Your Sacred Heart. When the Eternal Father sees it covered with Your Precious Blood, He will not refuse it. It will be no longer my prayer but Yours, O Jesus. O Sacred Heart of Jesus, I place my trust in You. Let me never be confounded. Amen.